Place flour in a plastic, zip-lock type bag. Add salt, ground black pepper and cayenne. Add beef to the flour mixture and toss to coat each piece. Heat oil in a large soup pot over medium heat. Add meat and brown on all sides. Lower the heat, add onions and garlic and saute for 5 minutes. Add tomato paste, cover and cook gently for about 5 minutes. Pour Guinness over meat; add the carrots and thyme. Stir, taste, and add a little more salt if necessary. Cover and simmer until the meat is tender, about 45 minutes to 1 hour. 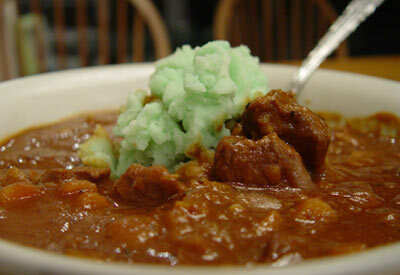 Add a fresh parsley sprig to each bowl of stew along with a scoop of "green" mashed potatoes*. Stew may also be served with plain boiled potatoes, colcannon, (mashed potatoes and cabbage) or champ (mashed potatoes, scallions, milk and butter). To make green mashed potatoes, stir a few drops of green food coloring to mashed potatoes just before serving.